Would Trump win again one year on? Donald Trump was elected as President of the USA on 8th November 2016 and has had a controversial first year in office. If he were to run again one year on, would he win? An election taking place in Virginia 364 days after Trump’s victory will give us a good idea. It’s a year since Donald Trump shocked the world and won the US Presidency. Highlights of his term so far include trying to ban people from Muslim-majority countries from entering the USA, defending white nationalists protesting in Charlottesville, withdrawing from the Paris climate agreement and travelling to the brink of nuclear war with North Korea. Given Hillary Clinton won the popular vote and the consistent chorus of public outrage surrounding the current Presidency, it’s easy to assume that if another contest took place on the anniversary of the 2016 election, the Democratic candidate would end up in the White House. That assumption is being put to the test in an election taking place on Tuesday 7th November to decide the next Governor of Virginia. A bit of background on Virginia: it is historically a swing state; George W. Bush and Obama both won it twice; Hillary Clinton won the state by about five percentage points in 2016; and there is no incumbent as governors in Virginia can’t hold office for consecutive terms. 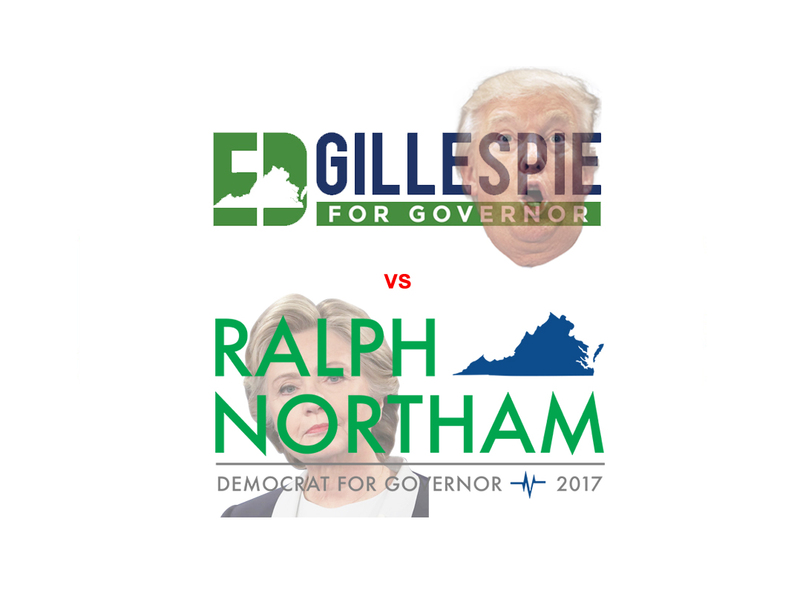 The Republican Party candidate, Ed Gillespie, has totally aligned himself with Trump’s agenda and the Democrat candidate, Ralph Northam, is from the Clinton (as opposed to Sanders) wing of his party. Like Trump in ‘16, Gillespie is campaigning on the issue of tax cuts, job creation and reducing illegal immigration. He has argued for the conservation of Confederate-era statues and complained about “sanctuary cities” (a city that limits its cooperation with the national government effort to enforce immigration law). And he has relentlessly attacked his Democratic opponent. Gillespie is hoping that by sticking closely to Trump’s Presidential agenda he will encourage a high turnout amongst conservative voters. Northam is campaigning on abortion rights, the environment and is attacking his opponent as being a reactionary running a nasty, racist dog-whistle campaign. The Democrat has more money to spend, has run more TV ads than his opponent and will be hoping to turnout the democratic base and add enough undecided women and ethnic minorities to beat his Republican opponent. Again, this feels very familiar. The race is seemingly too close to call with different polls showing widely different results; some have Northam with a double-digit lead and others have Gillespie just edging it. Strategists in Washington D.C and beyond are watching the race closely. The result will give a good indication as to the mood of the electorate and will provide useful intel as to how to play mid-term elections in 2018. And looking further ahead, if another Clinton-style candidate fails to succeed, it could influence perspectives on what type of nominee stands a chance of beating Trump in 2020.